Cherwell Link Autumn 2016 carried this article. KDW's Alan Lodwick was not amused....."What I have found particularly galling are the quotes from the Clr Colin Clarke claiming the benefits of this development "
KPC held a special meeting to discuss the situation on Thursday 13th October. We learned that they have taken legal advice and have written to alert Cherwell council that they are considering a judicial review claim. They have also commissioned an independent overview of the viability report. At the time of writing formal planning approval has not yet been issued. There is time to challenge the decision. KPC feels obliged to consider this, despite the cost implications for Kidlington tax payers who potentially would have to foot the bill for losing a legal case. I attended the meeting and was extremely impressed with the strength of the councillors resolve to carry on pursuing the matter. Had the Council refused the application then the developer would probably have appealed. An independent planning inspector would then decide if planning permission was appropriate. We have rehearsed the multiple points of policy that were overlooked or loosely interpreted by the planning officer who recommended acceptance many times. Here let us consider the process followed on the day. 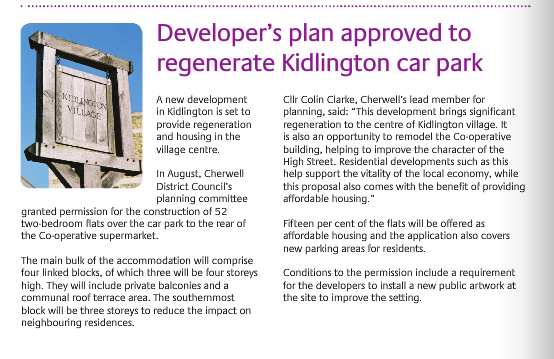 Neither of the Kidlington councillors were able to attend. It would have only taken that one additional vote to refuse the application!